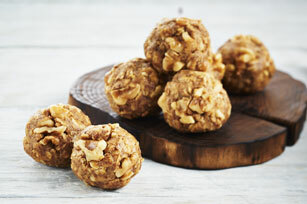 Our Flax-Appeal Peanut Butter Snack Bites recipe is a perfect example of how something that tastes really good can also be easy to make. Ground flax seed and chopped walnuts add extra crunch and flavour to these tasty treats. Mix peanut butter and honey in medium bowl until blended. Stir in remaining ingredients. These easy-to-make Flax-Appeal Peanut Butter Snack Bites can be refrigerated up to 1 week before serving. For extra crunch, prepare using Kraft All Natural Crunchy Peanut Butter.